CT’s rapid adoption for the diagnosis and treatment of various diseases has led hospitals and other providers to make substantial investments in CT scanning technologies. However, the future of those systems and subsequent investment is unclear, considering recent efforts by both private health plans and Medicare to constrain spending—as seen in the 2007 Medicare Payment Advisory Commission report to Congress on Medicare payment policy—and the changes that healthcare reform may bring. Nevertheless, the well-established value of CT imaging will continue to increase demand within facilities that can safely and efficiently provide such services. More than ever, proving value will be critical. With advanced imaging equipment such as CT scanners expected to play an ever-growing role in generating hospital income—for diagnostic procedures and an increasing number of interventional radiology and cardiology procedures—protecting this revenue source is a pressing concern for hospitals. Ensuring sufficient future capacity is a must, but determining how best to provide that capacity requires more study and scrutiny. When attempting to increase CT throughput and capacity, radiology department administrators, hospital executives, radiologists, and other purchasers have historically focused on the traditional approaches of increasing the number of CT scanners and/or redesigning workflow to increase throughput on existing scanners. Physical space and technologist staffing are less often considered, but providing extra space for a given CT scanner and adding technologists can dramatically improve the throughput of the existing equipment. With improvements to workflow redesign, greater throughput can be achieved without the high price of new equipment. Modern scanning equipment can cost upward of $3.5 million, including a fully integrated RIS and PACS and the space and infrastructure required to house such equipment. The return on investment often justifies the high cost. However, when considering the investment’s magnitude in the current economic climate, which, according to the American Hospital Association, is already affecting hospitals (see Table 1 and Figure 1a), purchasers need to be more prudent than ever in evaluating CT capacity. Due to the current economic climate, purchasers are reassessing their needs for capital expenditure/investment. 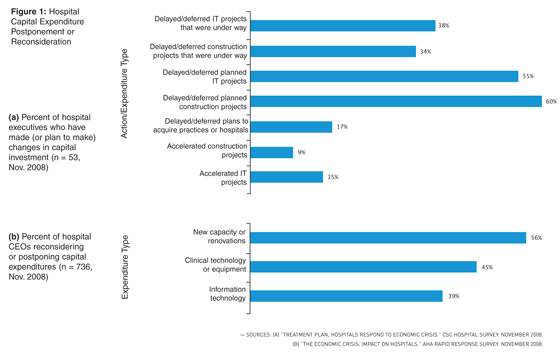 A survey conducted by Computer Sciences Corporation in November 2008 shows that 60% of hospital executives (Figure 1a) are delaying or deferring planned construction projects, and 34% are doing the same for projects that were already underway. Another survey conducted in the same month by the American Hospital Association shows that almost one half of hospital CEOs (see Figure 1b) have decided to reconsider or postpone what they deem a noncritical capital expenditure for the purchase of clinical technology and equipment such as CT scanners. 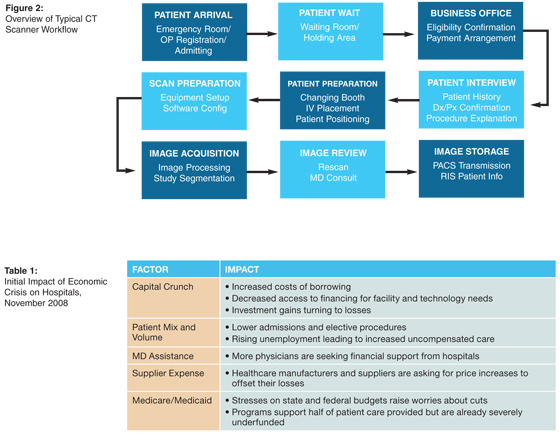 So, although the acquisition of a CT scanner has typically been considered a sound investment and an efficient use of resources, the capital costs associated with such a purchase are forcing executives to look more closely at other ways to streamline processes; increase demand, utilization, and capacity; and ultimately improve return on their assets. Instead of expanding capacity through the purchase of additional equipment or an extension of operating hours, what if your current CT scanners could be used more efficiently to increase throughput and capacity? This is not a new question. Many organizations have long been studying ways to do just that, but the focus has been predominately on workflow redesign—finding better ways to use the equipment and people to increase throughput. Because there are several steps along the CT workflow path, there are ample opportunities for productivity improvement (see Figure 2). While this is clearly a valuable avenue to pursue, recent studies, including an important one by Giles W. L. Boland, MD, on enhancing CT productivity, have shown that other opportunities exist for both improved throughput and margin by increasing your technologists. But what if you can’t increase hours of operation and don’t have the space to increase staff? Ensuring adequate space can have positive effects on staff productivity and patient satisfaction. Staffing, equipment, and space are deeply interrelated and changes in one affect the others, yet space is also the second most expensive asset for most hospitals, so addressing space concerns requires further examination. To maximize throughput, CT imaging has moved toward a technologist-driven model. When looking at a particular facility, there are several key questions that can be posed regarding throughput: Are these scanners being used productively? Is the space occupied by these scanners highly productive? Are they at capacity? Are they generating enough income to justify the space and staff they utilize? Given the potential revenues and high profit margins associated with CT scanning, the more relevant question is what is the right amount of space for this equipment to maximize throughput, income, quality, and patient safety? An evaluation of space productivity helps answer this question effectively through an integrated examination of several key performance indicators associated with patient throughput, staffing, financial performance, and the breakdown of departmental gross square feet. To address this question, information on labor costs alone is insufficient. What is the throughput of these machines? How much space do they require? How much revenue do they generate? Answers are required to confidently assess whether these machines are truly productive from the perspective of not only the equipment but the department and the hospital as a whole. Table 2 lists some of the key throughput, financial, staffing, and space breakdown metrics that should be examined when conducting an assessment. 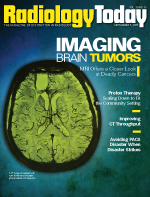 Computer Sciences Corporation utilizes its proprietary assessment tool called Space Productivity, and this article will apply it to measures for CT scanners to get an idea of how a sample analysis may look. 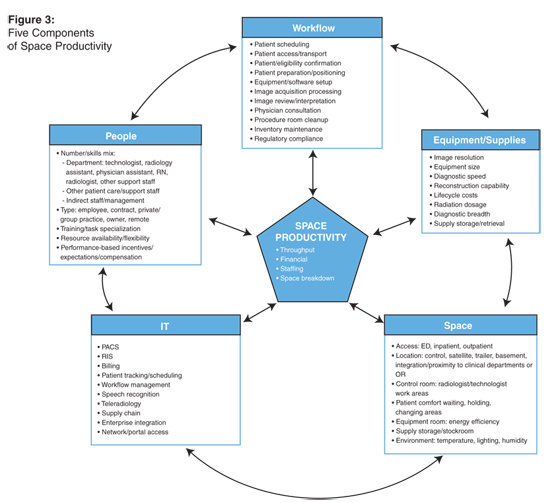 The five components of Space Productivity provide a framework to illustrate the components of CT productivity (see Figure 3). The key measures help an organization assess which solutions for increasing productivity should be considered or implemented. 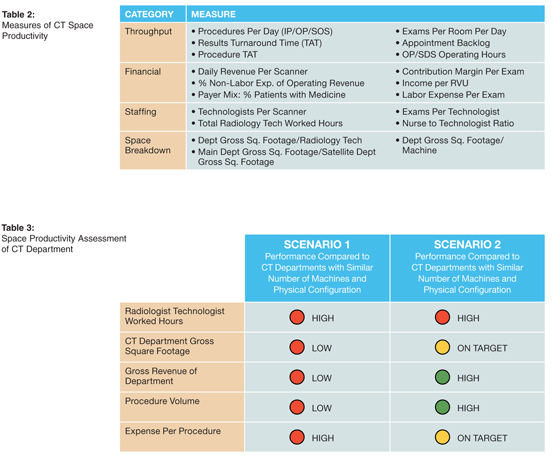 Three previously identified tactics to increase inpatient and outpatient CT productivity are the addition of technologists or other personnel, redefining workflow of technologists and other key personnel, and the enhancement and integration of existing information systems (RIS and PACS) and other databases associated with CT workflow. For hospital executives and managers to incorporate the concepts of maximizing their available space’s productivity in their organization, they must understand how their organization compares with industry benchmarks and best practices. An integrated look at the various interconnected key performance indicators of the Space Productivity tool allows one to determine sources of inefficiencies and opportunities for improvement. The first step in assessing of space productivity is to define an organization’s baseline performance based on key statistics, such as the number of machines by modality and physical configuration. For CT, measures should be compared based on departments with the same number of machines instead of comparing the operational performance of the CT departments of hospitals with a similar number of beds. Standard practices of examining a single benchmark may not provide enough (or the right) information; a broader approach can significantly enhance decision making. Analyzing hospital performance data (in this example, using Space Productivity) allows managers to consider people, space, volume, and money simultaneously. CT departments everywhere must evolve from a rudimentary management/benchmarking style to this more advanced, integrated Space Productivity approach. Table 3 is a simple illustration of this concept. If an organization were to look at radiology technologist-worked hours, both scenarios indicate that the organization needs to do a focused examination of these worked hours. However, using this benchmark alone does not provide much insight. As is shown in Table 3, the organization facing Scenario 1 is missing opportunities, while the organization of Scenario 2 finds itself in a desirable position. Presuming capital access issues will continue in the near term, extra care must be taken for those faced with the demand that is outpacing available capacity. The old methods of assessing operational performance based on one or two benchmarks may no longer meet today’s requirements. To remain quality driven and fiscally responsible and build long-term value by continuing to exceed customer expectations, healthcare executives must adopt more sophisticated operational analytic methodologies. Space Productivity offers a well-planned approach for relating space, throughput, worked hours, revenue, and expense. It allows healthcare leaders to gain an understanding of how well space is being used in their facilities. — Karl Korinek, MPH, is a staff consultant in Computer Sciences Corporation’s Planning and Operations Practice within the Healthcare Group, delivering practical solutions for providers in all healthcare settings in strategic planning, operations and performance improvement, patient capacity and throughput, and facility planning. His experience includes human functional MRI research at Columbia University’s Mahoney-Keck Center for Brain and Behavior Research. — Robert Denny, MBA, is a senior consultant in Computer Sciences Corporation’s Planning and Operations Practice. With 20 years of healthcare experience spanning medical device manufacturing and management consulting to hospitals and industry, his focus has been on operational improvement and process redesign.